Oh baking, how I adore thee! 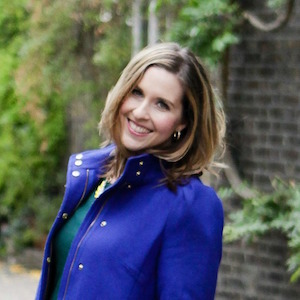 I know I say it all the time, so if you’ve been around my blog long, then I apologize. But baking is how I destress, and it’s also a way I express some creativity. 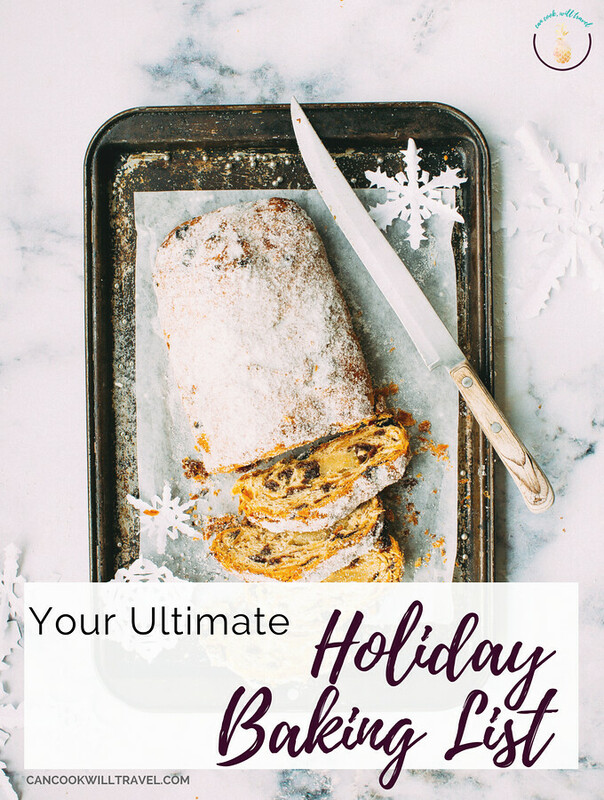 So this year I’m featuring my Ultimate Holiday Baking List for a one-stop place for all your baking needs! 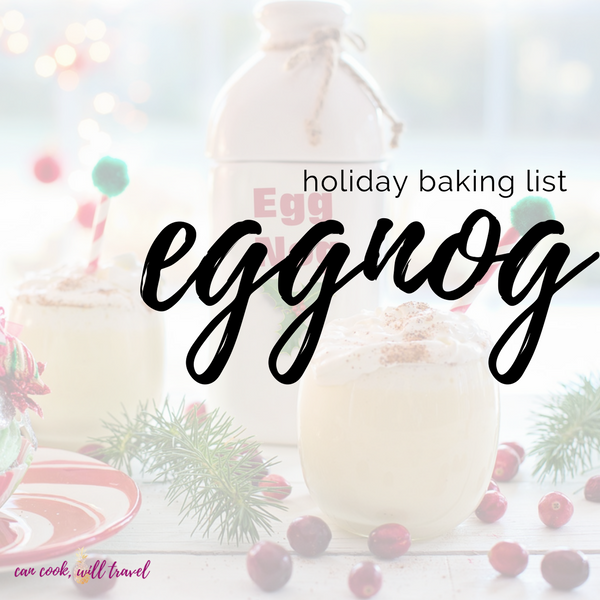 I’m pretty damn excited about this post, because just creating it has gotten me into the holiday baking spirit. 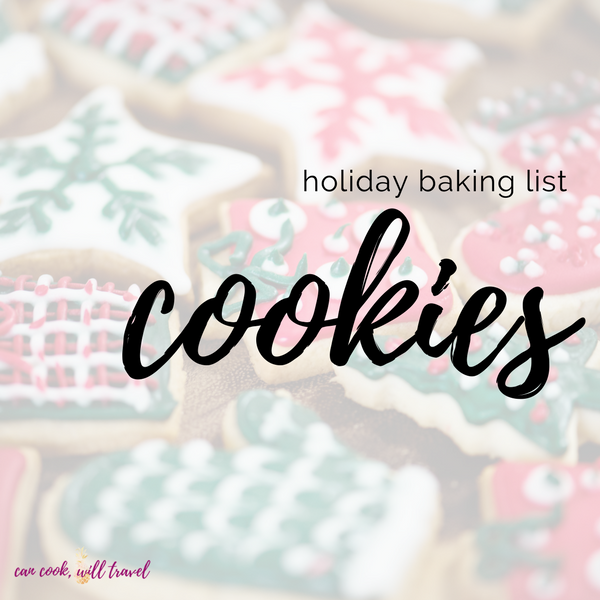 My favorite things to make during the holidays are cookies, so I’m definitely sharing those below. Our family traditions that my mom created since I was little was to make a plate full of baked goods and then deliver them to our favorite people. Usually the stuff we make isn’t anything I crave, but they’re still fun to make and easy to send off to friends and family. So I scoured my blog for my favorite holiday inspired sweets and then searched all over Pinterest for more inspiration. Oh my, I have come up with about 58 recipes that I’m sharing! Yep, you read that right, so don’t worry, because I’m going to keep this post organized. 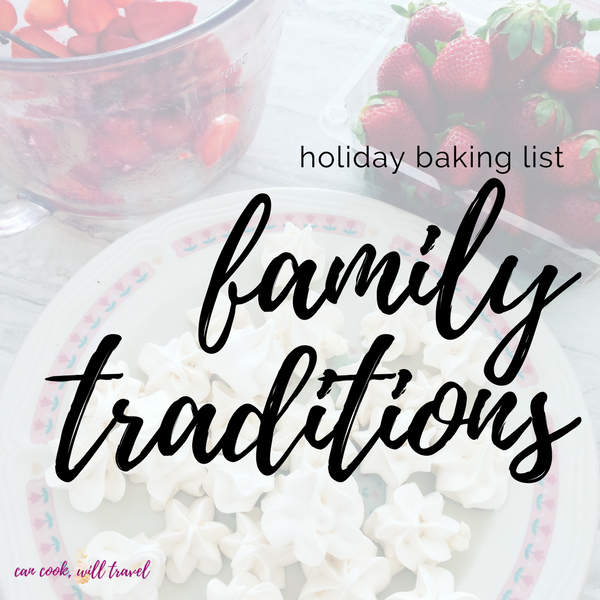 Family Traditions: These are a few recipes I found that are similar to what my mom makes (plus fudge with its own category). Fudge: There are so many fudge recipes out there, that it deserves its own section. 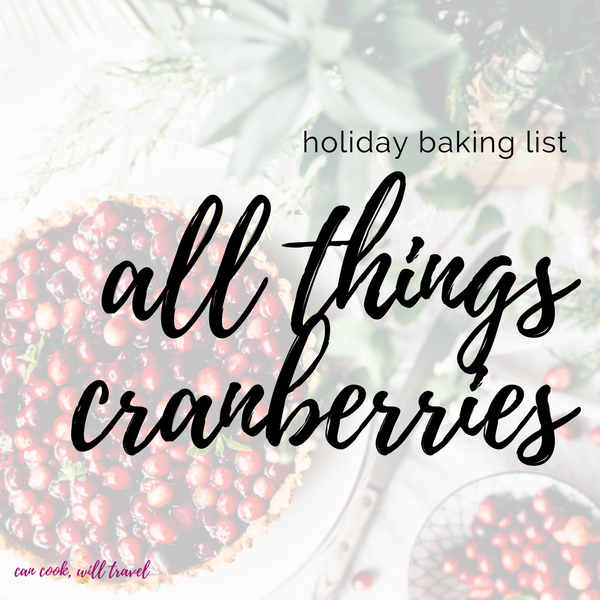 All Things Cranberries: Because I adore cranberries, and they scream holidays to me. Gingerbread: Anything related to gingerbread goes here! Eggnog: If you love eggnog, then you’ll love these recipes. No Bake: You guessed it…no baking required for these sweet treats! 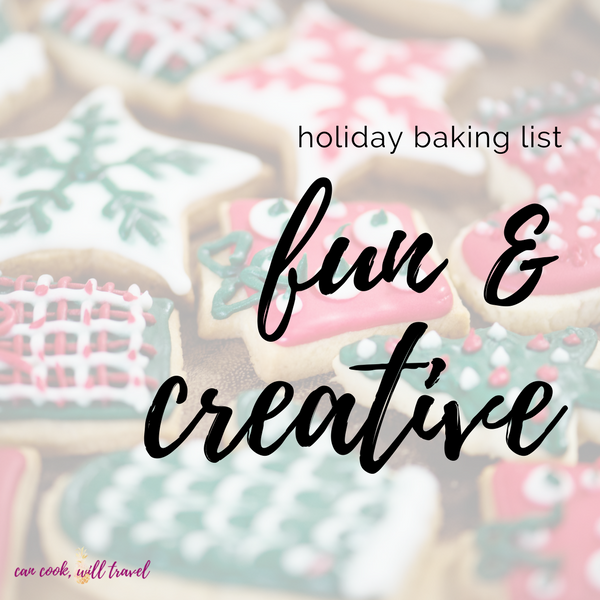 Fun & Creative: This section is for the really crafty bakers out there, so you’ll find holiday and winter themed goodies here. Truffles: Truffles galore is what you’ll find here, so that’s no surprise. 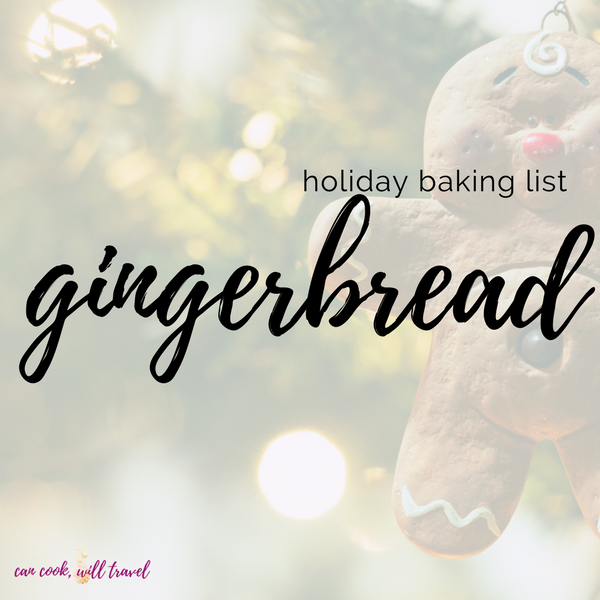 Let’s get this Holiday Baking List Started! Italian Wedding Cookies: These buttery cookies are filled with walnuts and hazelnuts with a powdered sugar coating. Homemade Divinity: (GF & DF) Divinity is a meringue filled with sugar and corn syrup that you can then add flavors and nuts to if you’d like. It’s definitely a fun one to make! Chocolate Salted Caramel Haystacks: This salted caramel twist on a family favorite totally intrigues me, because I love that flavor with chocolate. So sign me up! Chocolate Fudge: Here’s a basic fudge recipe that is sure to be rich and fun to make. Hot Chocolate Fudge: All the things you love about hot chocolate in a fudge recipe complete with marshmallows! Peppermint Bark Fudge: If you love peppermint and chocolate, then this is the fudge for you! Salted Caramel Chocolate Fudge: So this takes 5 minutes in the microwave and then you’ve got insanely good sounding fudge! Bailey’s Fudge: Yep, you add Bailey’s to something, then you’ve got my attention. Yum! Rustic Pear Cranberry Galette: This dessert is simple to make, pretty fun, and looks like you worked really hard on it. Talk about impressive! Cranberry Orange Bread: Oh this bread not only smells fantastic as it bakes away, but you can make these into mini loaves and give them to your favorite people. Yum! Pistachio Cranberry Cookies: These cookies feature pistachio pudding to make the cookies soft, dried cranberries for a tart bite and melty chocolate chips. I’ve made them a few times now at the holidays and they’re so good! Cranberry Scones: How how these totally deserve to make this list, because cranberries make me think of the holidays. They’re not overly sweet, which is one thing I love about scones. Oh man, I need more of these in my life right now! Cranberry Goat Cheese Kisses: These guys require 3 ingredients and a muffin tin and you’re ready to go! This is the perfect sweet treat to make with leftover cooked cranberry sauce, so get to baking! Almond Cookies: Ooh these almond cookies really look and sound like they’d melt in your mouth! Brown Sugar Pecan Cookies: I need these cookies in my life, and ASAP, so let’s whip some up this season! Christmas Stained Glass Cookies: (GF) These pretty cookies are seriously impressive, and also perfect if you have a gluten allergy! Dark Chocolate Candy Cane Cookies: Dip your dark chocolate cookies in mint and white chocolate for a festive looking treat! Raspberry Almond Shortbread Thumbprint Cookies: We used to make thumbprint cookies as kids and also eat them at school parties. They’re so pretty with a bit of sweet and brightness from the jam, so definitely try these out! Festive Shortbread Bites: For a buttery little bite that’s topped with holiday sprinkles, these look too cute to avoid! Salted Browned Butter Chocolate Chip Cookies: I’d say these cookies pretty much define perfection when it comes to chocolate chip cookies. They’re AMAZING! Peanut Butter Kiss Cookies: Ah these cookies can’t help but make me think of this time of year. I remember them during Christmas programs and parties and they always had me reaching for them first! Gingerbread Roll with Sugar Cookie Buttercream: For some reason these look so complicated, because they’re really cool looking, but the fact is they are actually pretty easy to make. So it’s time to impress your friends with this recipe! Gingerbread Cookie Bars: So these look super easy and crazy good. I mean what’s not to love, because you’ve got gingerbread topped with a cream cheese frosting?! Gingerbread Latte Cupcakes: Fluffy cupcakes with a creamy frosting that is gingerbread flavored – um yes, please! Soft baked Gingerbread Cookies: Who doesn’t love soft gingersnap cookies, because I think they sound fab?! Gingerbread Loaf: Because does anything smell better in the Winter? I love the warm spices and dark molasses to sweeten the bread for a serious treat or breakfast! Eggnog Gooey Butter Cookies: Some melt-in-your-mouth cookies is always a very, very good thing! Delicious Eggnog Cookies: Okay these sound amazing and are topped with a frosting that is also filled with eggnog, so yeah, let’s both try this one! Eggnog Fudge: Because I think I could definitely get behind an eggnog version of fudge! Eggnog Truffles: These guys are really fun to make, pretty difficult to mess up, and they are rich and white chocolate filled and so good! Sea Salt Chocolate Almond Clusters: Whip these up in the slow cooker and you’ll be serving them in no time! Cashew Caramel Clusters: (Paleo, Vegan, DF, & GF) Okay so the caramel is made from dates, which is healthy and genius! Just pile the “date caramel” on some cashews and cover with chocolate and you’ll be eating like a healthy queen or king! White Chocolate Ting-a-Lings: So these remind me of a white chocolate version of haystacks with peanuts added in. Easy and fun! Salted Caramel Pretzel Bark: Okay let’s face the fact that salted caramel is fabulous and if you cover it and pretzels with chocolate, it’s basically a home run! Christmas Muddy Buddies: I love the idea of this holiday version of Muddy Buddies! Marshmallow Penguins: These are seriously so cute, so make them with the kiddos and have a blast! Reindeer Bait: This Christmas crack recipe is filled with cereal, pretzels, marshmallows, M&Ms, and white chocolate. So fun for the holidays and to leave for Santa’s reindeer! Santa Crunch: For the popcorn lovers in your life, add some sweetness and holiday fun! White Chocolate Peppermint Pretzels: These sound super easy to make and are really fun and festive! Peppermint Patties: Oh these are ridiculously delicious and taste even better than the store-bought kind! Melted Snowman Chocolate Bark: You must click that link simply to see how adorable this bark is, and what a wonderful gift to whip up! Reindeer Cookies:If baking isn’t your thing, then this cookie recipe is SO for you! All you do is compile a bunch of pre-made ingredients to create these adorable cookies! Snowflake Cookies: They look so pretty that I wonder if I could make them myself, but perhaps if you have a steady hand, you’ll be a cookie making whiz! What holiday baking list would be complete without sugar cookies, after all? Birch Log Cake: This cake is straight up gorgeous, looks way easier to make than you’d think, and is crazy impressive! Hello, Winter! Snowy Chocolate Pinecones Recipe: These guys look really difficult but in reality they’re super easy and fun for kids to make! Reindeer Sugar Cookies: I think I could actually make these adorable reindeer cookies, so definitely check these out! Spiced Christmas Tree Brownies: Oh these are so adorable that you just gotta give them a try! Chocolate Gingerbread Men with Candy Canes: This is the cutest little gingerbread man ever as he hugs a candy cane, so you gotta check it out! Christmas Cranberry Macarons: I’ve always wanted to try macarons, so I’m not sure they’ve looked any cuter than these Santa versions! Candy Cane Twist Cookies: These cookies remind me of ornaments we made as kids with white and red cookie dough wrapping around each other to form a cute candy cane. Vegan Candy Cane Meringues: (Vegan & DF) Okay so these are seriously so adorable yet they’re vegan (meaning no eggs), which is super creative! Reindeer Rice Krispies: If you love Rice Krispies Treats, then you’ll love this reindeer version! Kahlua Chocolate Truffles: (GF) Let’s face it, they had me at Kahlua, so these are a must for this holiday baking list! Gingerbread Cheesecake Bites: Um yes so these absolutely need to happen in my kitchen! Cream cheese, gingerbread flavored coffee creamer and cool whip for a fluffy truffle rolled in gingersnaps! Peppermint Oreo Truffles: These truffles are pretty and pretty impressive with a peppermint crunch on the top! Homemade Ferrero Rocher Truffles: If you love these little treats, then you can now make your own and they look so pretty and delicious! Peanut Butter Balls: Pretty sure I could eat these guys year round, because there’s no better combo in my book! Mint Oreo Truffles: These are Oreo balls using mint flavored Oreo cream, which sounds crazy good! Christmas Sugar Cookie Truffles: Make a sugar cookie version of truffles for a sweet, holiday treat! Yes, please! 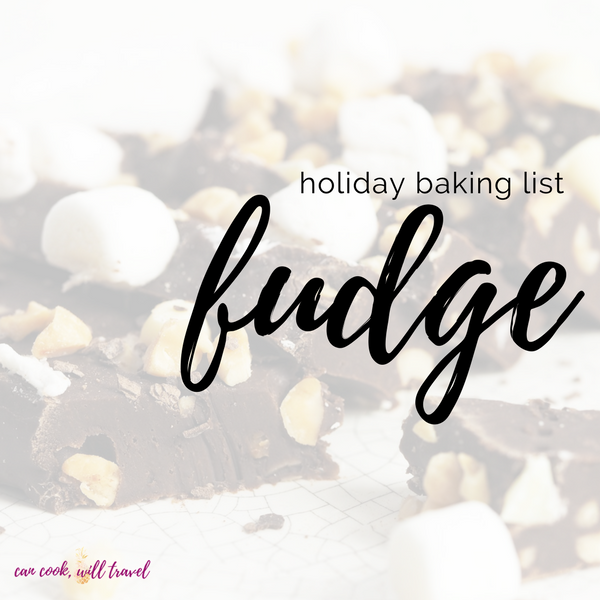 What is your favorite section of this holiday baking list? 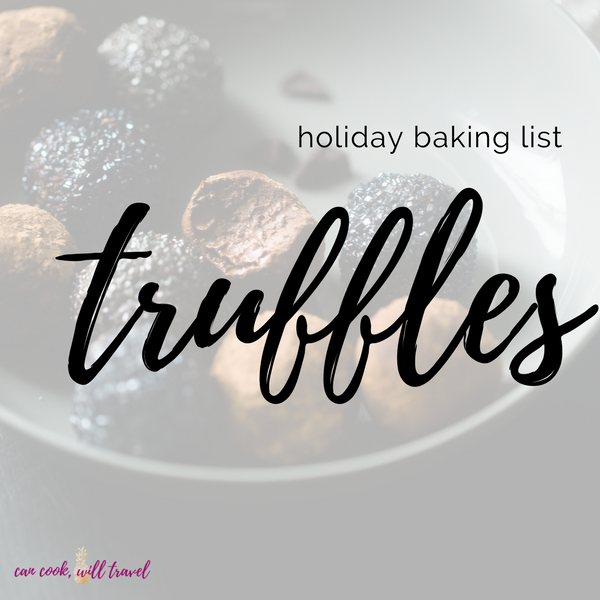 To make it’s gotta be cookies, but to eat Truffles and Gingerbread are near the top of my list! Comment below and let me know, so we can chat about it. 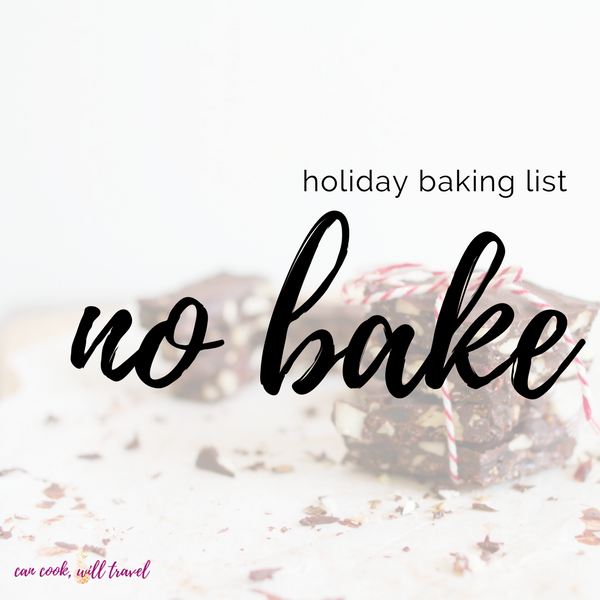 Oh holy holiday baking, that is quite the list! So I suggest pinning this post so you can reference it throughout the season. My hope is you’ll find it useful this year and long into the future. 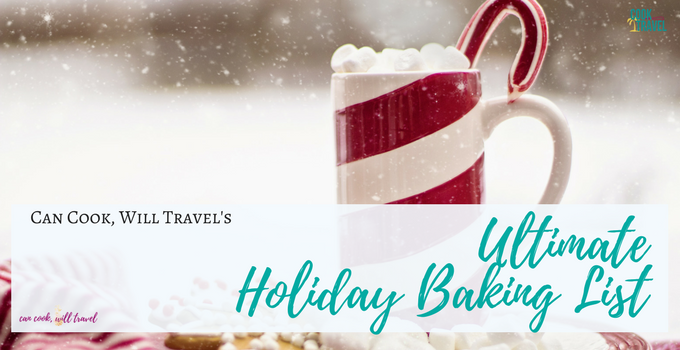 Stay inspired & happy holiday baking!